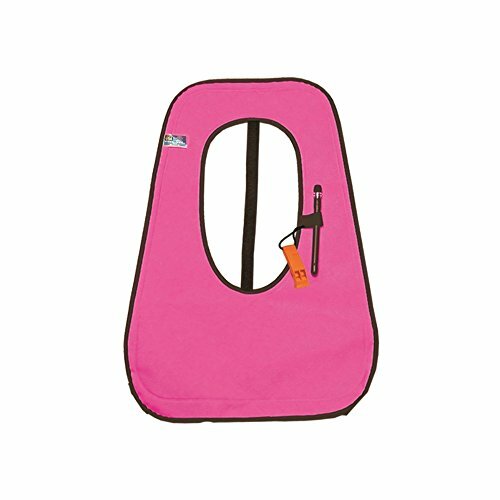 While at first glance it is easy to confuse one with a life jacket, one of the best snorkel vest can do a lot more than merely keep you safe. It gives you an added element of buoyancy and control during your dives and makes swimming a lot less tiring and a lot more fun, but only if you choose right. Choosing a snorkel vest, in particular, tends to be an understated priority for many snorkelers. Here is a table consisting of good snorkeling vests we recommend. As we mentioned in the beginning, it is easy to pass one off as a life jacket, but there are some distinct but subtle differences with a snorkel vest. 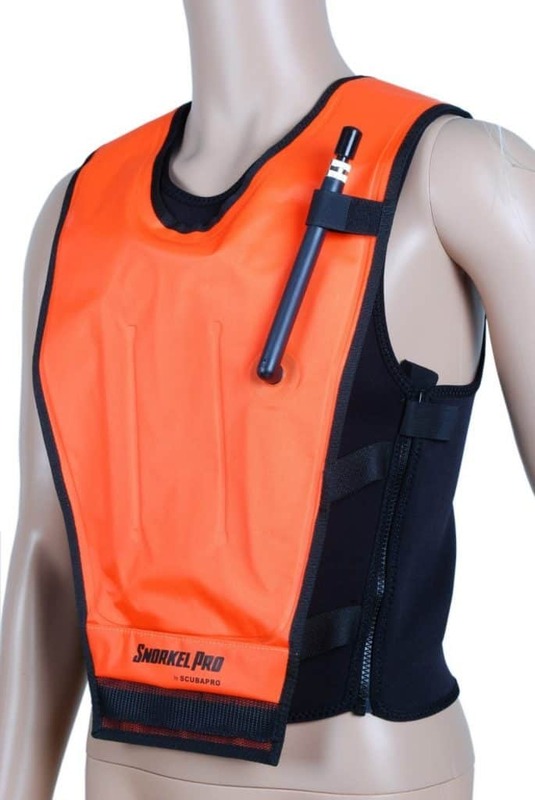 Unlike life jackets which have been designed specifically to keep you afloat, a snorkel vest is made to improve your underwater experiences altogether. It provides you with a certain level of buoyancy so that you do not have to make much of an effort to maintain balance and stay afloat. And that means you can devote more of your faculties to everything going on around you and under you. Going by your personal preferences there are some basic criteria to refer when deciding which snorkel vest is best for you. 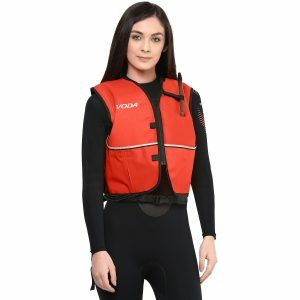 So your personal preference will be the main factor in choosing a snorkel vest beginning with the broadest category you should consider: types. With snorkeling vests, there are not an awful lot of them, just the Horsecollar, Jacket and hybrid. This is likely the most prevalent kind of snorkel vest currently being used. It is essentially a single bladder with an almost centered hole through which the head is placed. It is fastened on to the body with either single or dual adjustable straps made of nylon. The straps are configured to keep the buoyancy bladder firmly around the waist and not stray away in any direction. While the standard form of this design is in the shape of an oval, there are some variations that help make it less cumbersome and more stable. This is worn the exact same way as the horsecollar, it is clearly quite different. It fits around you like a sleeveless jacket. The bladder only covers the front torso. The actual vest is fastened onto the body using either straps or a zipper. This is currently sported sported by just one company: ScubaPro. The design is essentially a combination of horsecollar styling with a neoprene sleeves vest. Available in five different sizes, a zip running along the side of vest makes it quite easy to slip in and out of it. If you have gone out to inspect snorkel vests before, you will already know it is not exactly like clothes shopping. Since the order of priority here begins with buoyancy, the one you select should be adept at keeping you afloat more than making you look good. Choosing between different sizes in snorkel vests is down to the weight of the customer. Weirdly, most manufacturers do not include the term ‘large’ in their range of sizes. Usually, the order tends to be small, medium, regular and extra-large. Also, the weight designated to each category can vary with each manufacturer so always make sure you consult their chart of size relative to weight before making a purchase. The Jacket design, for instance, is notoriously limited in its range of sizes that can fit you. It is important to consider the adjustability of the fastening mechanisms like straps, zips and buckles. With regards to strapping, the horsecollar design is usually the most versatile. Meanwhile, the most common mechanism being used is squeeze clip buckles made of strong plastic. Others such as zippers use plastics as well as metal. Of course, if there is metal involved, one must be assured that it is anti-corrosive. The vest itself needs to be pumped manually by the wearer. The inflator tube for that is typically placed on the front. It is made either of metal or plastic, metal being the more durable option. In Snorkel vests of superior build quality, the tube tends to be made of brass. While the mandatory features one must look for are not excessive, there are some other options of convenience that could weigh in on your decision. Aesthetics for instance. Unlike the products of yesteryear, the modern range of snorkel vests come with a wide selection of colors and prints and additional gadgets like whistles and pockets. After considering the aforementioned mandatory features, we can now take a brief look at each of our top selections likely to suit you as an ideal snorkeling vest. This vest is highly recommended among consumers. It features a heavy duty zipper on the front, an adjustable waist strap, neoprene on the back for more comfort, an overall bright yellow and durable nylon design, a conveniently place locking oral inflation tube and comfy rolled edge collar. It is further highlighted by a 3M reflective tape so it can be easily spotted from a far distance. 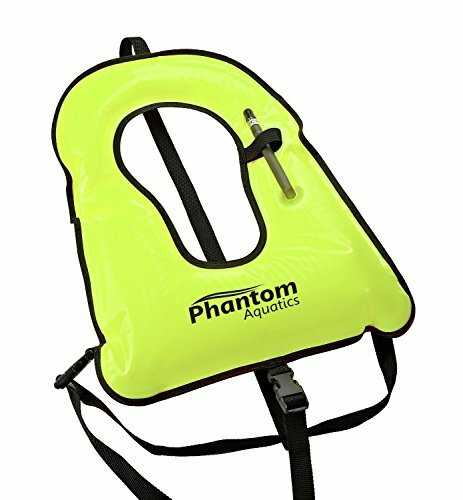 With regards to maintaining buoyancy, the Phantom Aquatics Snorkel Adult Vest is quite competent, able to seal enough air to keep even the heftiest bodies afloat without much stress. And by hefty, we are talking over 6 feet and 200 pounds here. The fact that it can be easily picked out from a great distance is a key safety feature. Any snorkeler in distress should never take too long to be spotted as time is a crucial factor in any emergency at sea. However, it is not all perfect. Some of the most common complaints regarding this product have been about the fit on. If the proportions of your body are a little more specific than average, adjusting the straps can be a little tricky. But once you have figured it out, it should be quite comfortable and good for spending half a day at most in the sea. The Deep Blue Bear Snorkel Vest is made of 210 denier nylon which is quite durable. It also has an adjustable strap for the waist and crotch so comfort is customizable and a locking inflation valve to provide stable inflation during snorkeling and relaxed deflation for free diving. It is designed for adults only and comes in two sizes: standard which is good for individuals weighing between 90 to 220 pounds and XL for individuals over 220 pounds. The majority of reviews by consumers are resoundingly positive. Deep Blue gear is reputed for its quality and sense of style. Those features show through very well their snorkel vest along with very good value for money. It would certainly be a good idea to purchase one in advance as opposed to renting it from a hotel or beach house. The materials are firm and durable and there are no issues with fitting it on even if there only are two size options available. The ScubaPro Cruiser Skin Dive Safety Snorkelling Vest comes with advanced buoyancy capacity and control as it features a dump valve in addition to the oral inflation tube. It is not particularly suitable for snorkeling in warm water as the neoprene material in it can insulate heat to an uncomfortable degree. However, it does offer increased protection from exposure to the sun’s UV rays. You also get a pocket for any personal items you might want to take with you and a handsome range of sizes to choose from. Should you find yourself not exactly fitting under any category here, it is best to order one size up. 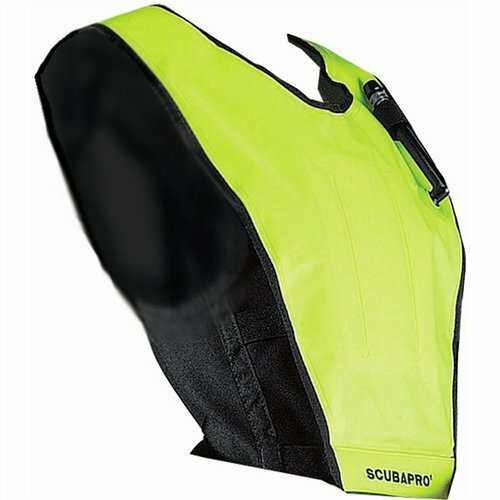 While it satisfies the essential bits of a good snorkel vest, the ScubaPro also comes with the added benefit of styling in its design. Its wide range of sizes make it very well fitting for most divers and the advanced floating design takes a lot of the hard work out of swimming and dealing with the current. The main criticism perhaps is that it is a bit on the expensive side and the buoyancy can be a little overwhelming for some swimmers. But apart from that, it is extremely well sorted. 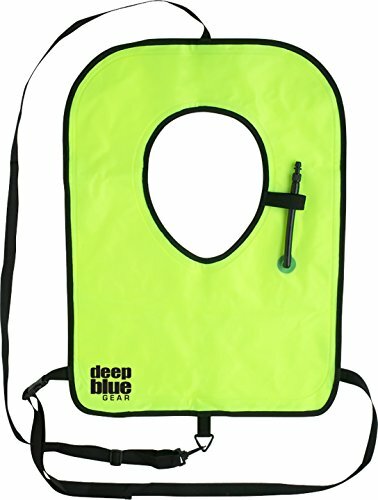 As one might deduce from its name, the Scuba Choice Adult Neon Yellow Snorkel Vest is designed primarily to fit adults weighing over 100 pounds and under 200 pounds. It is colored in high visibility neon yellow. It has an adjustable strap to keep it from riding up when inflated and it has an easy to use oral inflation tube. 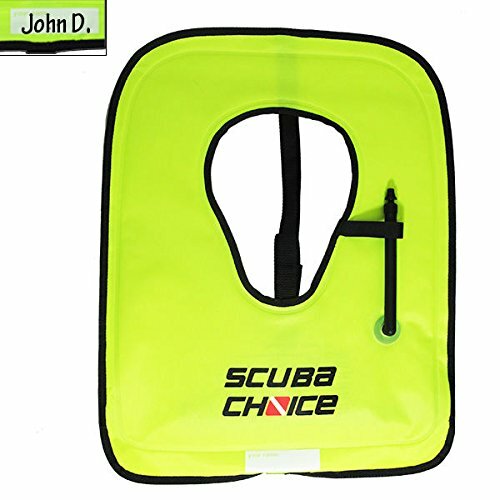 As ever with any activity to be done on the high seas, safety is the number one priority and Scuba Choice has responded well by having their snorkel vest finished in neon yellow so it can easily be spotted over long distances. It is also quite practical, swiftly inflating as well as deflating and can be crammed into a tight spot in your luggage. Given that it is not particularly expensive, it presents great value for money. Its apparatus is simple to use so it is suitable not just for adults but children as well. While the ideal range for weight among consumers is under 200 pounds, an XL size can still accommodate more than that with ease. In fact, the boundaries for different sizes have been criticized for not being strictly accurate. Some consumers have required the XL size even though their weight suggested they stick to the L category. Still overall, it will do a great job for anyone on vacation. The Innovative Scuba Snorkel Vest is made of 210 denier urethane-coated nylon which makes it extremely durable. Some of the other headline features are a design which enhances buoyancy while still maintaining comfort, adjustable straps so it can be easily configured to suit your figure and a metal screw-down oral inflation tube which can be used underwater. It comes in a good range of sizes as well. It has a size for children up to 100 pounds, for regular adults between 100 and 190 pounds and an XL size ranging from 190 to 230 pounds. For most customers, this tough snorkel vest performs precisely as advertised. It is adept at keeping you afloat so even those who are relatively insecure about being in the water can feel safe. It is also quite practical able to occupy very little space in your luggage. The majority of the criticisms have been focused on the sizes and straps. For some, their designated size has managed to fit them rather poorly. As for the straps, unless they are adjusted properly, the entire vest has the subsequent tendency to ride up and be rather uncomfortable. But of course, once it has been properly fitted on, there are none of those problems whatsoever. 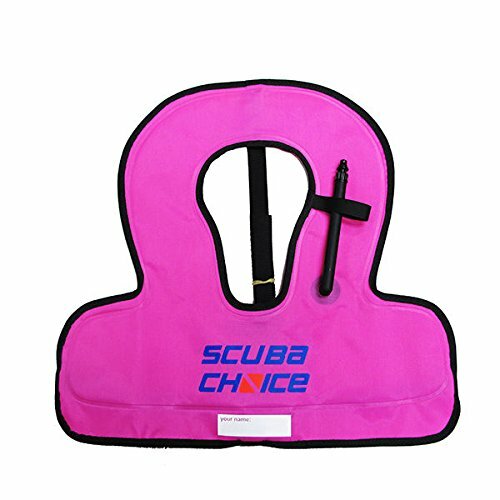 The Scuba Choice Kid’s Snorkel Vest is designed to be one of the simpler ones in the market. It is designed exclusively for children and features a removable strap to keep it from riding up and a simple oral inflation apparatus. It is suitable for children weighing under 100 pounds. In terms of usability, many parents have deemed the Scuba Choice Kid to be more than satisfactory. The fit is just right and enables youngsters to be carefree and completely focused on enjoying themselves. It is also a very practical snorkel vest, easy to pack and easy to set up. Where a major concern around snorkel vests for children is a tendency to leak air and lose buoyancy, this vest is a model of reliability. It delivers a stable diving experience where youngsters and their parents can rest easy and have fun without dealing with any unexpected quirks. It is a product recommended wholeheartedly by just about any parent who has bought one. For all intents and purposes, these are some of the best snorkel vests you can find anywhere. They have all delivered very well for the majority of their customers and make the activity of snorkeling safer and more enjoyable. A snorkelling trip is incomplete without a pair of one of the best snorkelling fins. Full face snorkel masks are a rising trend among both experienced and novice swimmers alike.